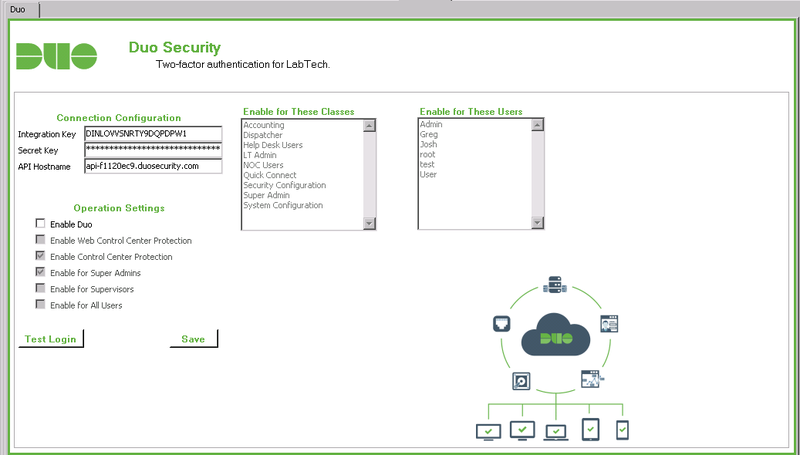 Duo Security Two Factor Authentication has come to LabTech Software. I have written a Plugin that implements this security and allows you to configure it completely and set it to each user\User class and system type. Duo Security's hosted two-factor authentication service brings strong, scalable security to organizations of any size. Duo's unique, high-availability architecture provides centralized management, self-service enrollment, and interactive secondary login through an intuitive web interface, eliminating the high costs, complexity, and confusion associated with traditional two-factor systems. Every day, over 1,000 organizations in 80+ countries around the world rely on Duo for their security. Download the Plugin and Install It Here. Updated, Will work in non US Environments. Thanks Greg, excited to try this out. We have looked at authanvil in the past, but it was deemed too expensive at the time. I'm not yet familiar with Duo, other than from their site it appears fairly affordable, how does it compare with authanvil? I like DUO better as it supports a lot more services and even has Google Authenticator support. The cost is less expensive as it's per user and not per token like AuthAnvil. You also don't have to host your own authentication server. There are two rather large advantages with AuthAnvil. - You cannot create a grouped user and this is a biggy. You can't allow your techs to share a domain admin account for a client and still each use their own token. That being said, I am still moving forward with DUO as we never rolled out AuthAnvil to our clients and we've had it for years. Just a follow-up.... I called DUO and all of the above issues can kind of be achieved. I have installed this plugin. I have entered our Auth API creds and saved. I then closed and re-opened the screen, enabled and selected a test user (my account). When I click the "Test Login" button, I enter my LabTech username and DUO passcode - and it says that the passcode failed. Thanks to "damadhatter", I have been able to get DUO setup and working! A) Use the Web SDK, NOT Auth API. B) Make sure that my LabTech username matched my DUO Security username. Once those two things were done, I was able to successfully pass the "Test Login". I was also then able to activate it against my LabTech username and begin logging in with DUO enabled. - Any chance of tying this into the "DUO Push" functionality so that we get prompted by the DUO mobile app and just click the "Accept" button for login? Odd issue I am having now, today I started getting told that my pass-code was invalid (I see no authentication attempts on Duo's webpage) I went into the Duo plugin integration and unchecked "Enable Duo" now I am unable to re-enable or do anything with it. I tried unchecking the plugin and re-checking it in the plugin manager and still nothing any ideas? It has been a few months without and posts to this topic. This looks really interesting to me, but I was wondering if anyone could provide a quick review after using it for a few months? I had issues with the DUO itself, since I was using the free version only support is email took almost 48hrs for a response. Needless to say I removed the plugin so I could log into my LT server. I've entered my information and saved it, and restarted the LT client, but I cannot "Enable Duo"-- the box is greyed out. Anyone else? Mine is suddenly not working either. Made no changes. Been that way for a few weeks. The 'Enable Duo' checkbox is greyed out for me. Any clues on how to get it so I can change it? Is anyone else using this successfully? Downloaded and installed ok, but after entering details, all boxes are greyed out to enable Duo. We are big fans of Duo and would love to have it protecting LT.
Just a quick reminder that items posted here to the LabTech Geek are NOT supported by the standard support teams of LabTech. Anything posted here is community driven and community supported. Thanks. This is actually a plug-in that LabTech should officially support. It stopped working for me as well. I cannot reproduce this issue in my labs. I would suggest uninstalling the plugin through the plugin manager and reinstalling using the above plugin. Once done, enter the Keys and Hostname, Save. Close the form and reopen. Any ideas for those of us for whom it *WAS* working and is now not? Damn glad I didn't tie my admin account into this. I would suggest uninstalling the plugin through the plugin manager and reinstalling using the above plugin. Once done, enter the Keys and Hostname, Save. Close the form and reopen. Does the plugin support LabTech cloud installations? It's working now!! Has anyone figured out how to get PUSH working? The duo documentation says just type PUSH into the duo token field, but that isnt working.